Dawid Ha'Cohen Russ was born ca 1861 to Elias (Eli) Russ (b. ca 1842) and Chaje Pressburger in Łańcut. He had a younger sister Cipre Pessel (b. 1866) and a brother Jacob (b. 1869), both born in Borysław. Elias, the son of Isaak and Süssel Russ, settled in Borysław when Dawid was young. When Elias became wealthy after discovering oil under the house he was living in. he moved to Drohobycz. Dawid became a leader of the Chortkover khassidim in Borysław, the followers of Rabbi David Moshe Friedman. Elias did not approve of his son's religious fervour; he and Dawid were estranged. Both Dawid's siblings Cipre Pessel and Jacob married and had children, many of whom died in the Holocaust, among them, Ester Ruhdörfer, Borysław's only paediatrician. After his first day at school, Dawid's oldest daughter Blume (b.1885) approached the young man and asked him to teach her Hebrew privately. He hesitated out of concern that it might disrupt her family, but after she described her years in a Polish seminar, the only Jew among Poles and Ukrainians, he relented and agreed to teach her. Blume was a bit of a rebel who, when the teacher at the seminar asked what nationality she was, replied she was a Jew. The teacher said there was no such thing. Blume replied that there was a nation – Palestine - and a language – Hebrew! After the first lesson Blume persuaded the young Russian to let her younger sister Sara join the class, She then inveigled him to add all the remaining sisters; suddenly he had a class of five girls aged from twenty to seven. Blume asked that the class be held at five o'clock in the afternoon, not a particularly convenient time for him, but she had a good reason; five o'clock was when her father, adamantly opposed to his daughters' studying Hebrew or the Torah, went to the shul. Dawid learned of his daughter's behaviour when some of his friends accused him of hypocrisy because his family were acting opposite to what he preached. He had no idea what they meant, but since it was a small community, his friends had learned of his daughters' Hebrew lessons. Dawid rushed home and had a terrible fight with Blume. It seems that his daughter's deception caused him to fall into such a severe depression that his family feared for his life. Chane Mindel was so concerned, that she called Dawid's father to come to his side, although to no avail. Dawid eventually recovered and Blume became engaged to Wolf. However, Wolf`s activities raised a great deal of animosity within the community – some accused him of "corrupting their daughters` and promoting socialism." This "war" culminated in an attempt to have Wolf arrested as an anarchist, an attempt that was thwarted by Blume. The photographs and information on this page were submitted by Dr David Scriven, the great grandson of David Russ and grandson of his daughter Sara. Some of the photos on this page were made in the Drohobycz studio of Wilhelm Russ. It is not likely that Wilhelm was related to Dawid Russ. See The Family of Wilhelm Russ. Both ardent Zionists, Wolf and Blume carried out their plan to emigrate to Palestine (then under Ottoman rule) in 1908`and took on Hebrew names: Wolf Kramarov became Ze`ev Carmi and Blume became Pircha. 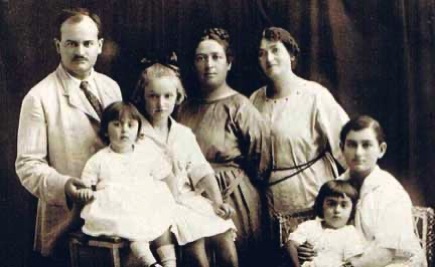 They first settled in Rishon Le Zion where they had a daughter Ziona (seen at the right with her grandfather Dawid). After other travels they moved to the Tiberius region, where Ze'ev became a school principal, first at Yavne'el and then in Menahemya. Pesia (Pnina) joined them there in 1913. Dawid Russ's son Leon (Leib) (1881-ca 1942) returned from Germany and became a metal worker. He married Riwe, daughter of Sender Spandörfer (Kreisberg) and Feige Kupfermann. They had three daughters: Lea (b. 1908), Frieda (Freude) (b. 1909), and Bronia (Bruche) (b. 1911). 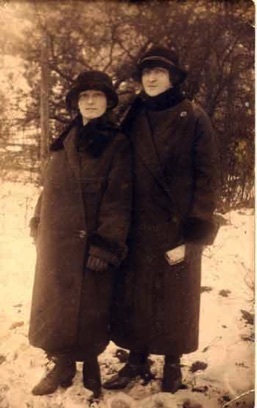 All married and had children, but everyone except Frieda and her daughter perished in the Holocaust. Frieda married a German neighbour; they had a daughter Ilona. Her husband was killed when the German army occupied Drohobycz. 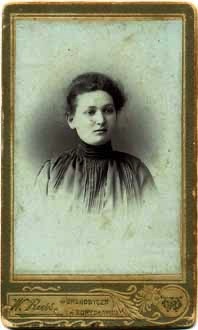 Frieda left her daughter with a neighbour before she was put on a train for Bełżec. When it stopped in the middle of the night in an unpopulated area, she (and possibly others) managed to escape into the fields. She survived for three years, working on farms in Silesia. After the war, Frieda was reunited with her daughter and made her way to Israel. grandfather Dawid had some kind of business with nails (hardware), but they were poor. Riva remembered being very hungry in Borysław as there was little food and most of it was inedible (probably because it during the First World War. In the summer, she was sent to her father's family in Rymanów to recuperate, as it was farming country and they had plenty of food. 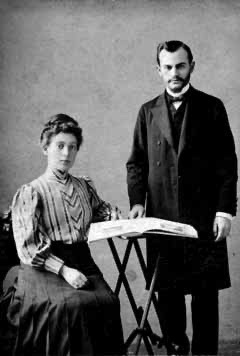 Dawid married Chane Mindel Pomeranz, who was born in 1859 in Drohobycz. According to the records, they had twelve children, of whom six survived to adulthood: one son Leib and five daughters: Blume, Sara, Pesia, Malke, and Gittel. 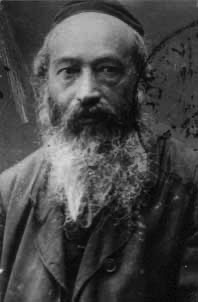 As a follower of a strict khassidic sect, Dawid had strong views about the education of women and the study of Hebrew. He did not wish his daughters to study, and also considered that because Hebrew was a holy language, it was not appropriate to learn it as a language to be spoken. Nevertheless, Dawid's wife Chaje Mindel wanted her daughters to be educated; they were also determined to study. Chane Mindel's attitude to education was not limited to her daughters; she had previously taken their son out of the kloyz (small synagogue) without Dawid's consent and sent him to live with relatives in Germany, where he studied mechanics. In the early years of the twentieth century, a young Russian by the name of Wolf Kramarov, who had left Russia to escape military service, came to Boryslaw. A teacher of Hebrew, he had been sent by the Teachers Association in Rohatyn to set up a school. 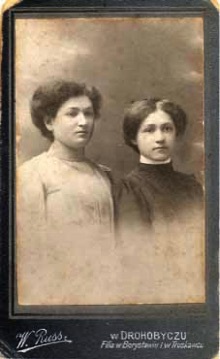 At the end of the First World War, the twins Guela and Drora were born, but because of the children's illnesses, the family left Galilee and eventually moved to Haifa, where Pircha's sister Sara and her daughter Riva joined them around 1919-20. Ze'ev started the Amami A School, which was later acknowledged as a landmark in Hebrew education in Israel. Dawid emigrated to Palestine sometime after Chane Mindel`s death. At first, he lived with the Carmis. He later moved to Jerusalem where he died and was buried on the Mount of Olives, although his grave was destroyed during Jordanian rule. After the annexation of Austria by the German Reich, Malke, Leo and their daughter escaped from the country. They were processed through the IKG (Israelitische Kultusgemeinde), the Jewish cultural organization that Adolf Eichmann reconstituted to achieve his goal of making Austria Judenrein (free of Jews). Leo Achtel was systematically stripped of his assets and belongings until he received a document from the Matrikelamt at the IKG, dated 10 August 1938, with a stamp by a German major that states, " There are no reservations about emigration." Their passports were issued on 12 December 1938; they arrived in Palestine on 30 January 1939. There is also an entry for Leo Achtel in a listing of Jews with assets of more than 50,000 Reichsmarks that were seized by the Nazis. In his biography, Ze'ev Carmi noted that he and Pircha gave them their old furniture because they had nothing when they arrived. By emigrating to Palestine, all of Dawid and Chane Mindel's daughters and their descendants survived the war. After this, the couple left for Drohobych, where they stayed with Blume`s grandfather Eli. They later briefly returned to Boryslaw to get married by the khassidim and were reconciled with Dawid. By 1929, the youngest daughter Gittel (Gita) had moved to Palestine. The fourth daughter Malke married her first cousin Leo Achtel and moved to Vienna. Sadly, it was on a trip to Vienna that Chane Mindel died in 1928, either on the train or just after her arrival. The picture shown at the top of this page is from her passport, which was issued three days before her death.